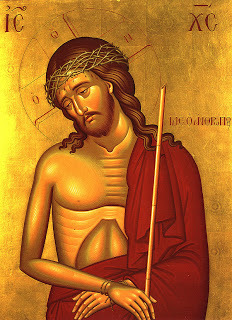 This week is Orthodox Holy Week. On Friday, Jesus will be crucified. On Saturday, we will quietly mourn. On Sunday, he will rise again. I am feeble and sore broken; I have roared by reason of the disquietness of my heart. Lord, all my desire is before thee; and my groaning is not hid from thee. I have roared. Wow. Most Bibles translate that as groaned instead of roared. But I like roared. I can hear the anger and anguish behind that word. I can hear the urgency: See me! Hear me! I roar! That’s what I want, too – to erupt, to roar, to have a voice, to break open the ground I’ve always walked on. I roar because I am imperfect. I roar because I am broken. I roar because I am selfish. I roar because I am searching. I roar because I am hurting. I roar because I am sorry. I roar because I want to be strong. I roar because I want to be saved. I roar because I want to be found. I roar because I want joy. I roar because I want God. I roar, and I hope. I hope that He hears me. And finds me. And saves me. And us all. Can You Find God Outside of the Church? This is beautiful, Karissa, thanks so much! I love LeGuin’s words,”When we women offer our experience as our truth, all the maps change.” We roar indeed. Great post. Blessed Holy Week, my friend.